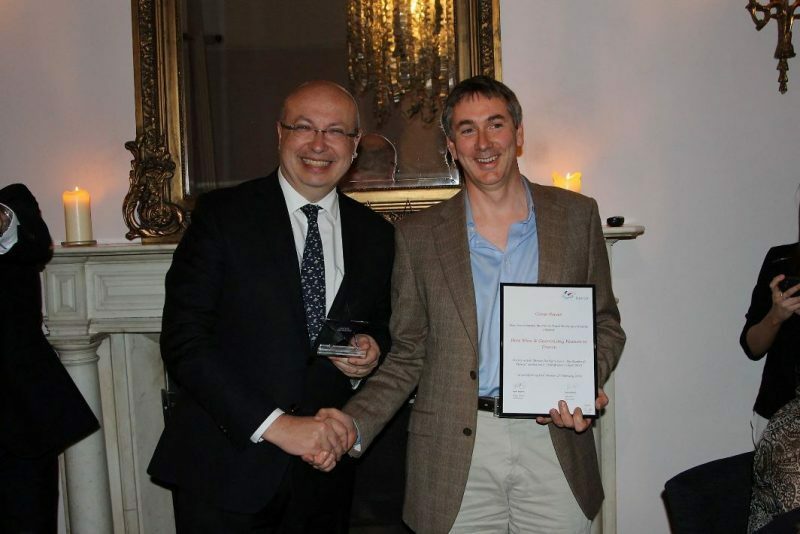 Conor Power receiving the award for best article in the Gastronomy & Wine category from French Ambassador Jean-Pierre Thébault at the inaugural French Travel Media Awards, 2 March 2016. In attendance at the Cliff Townhouse in Dublin were 13 representatives from a number of regions in France, the cream of the Irish travel media and French Ambassador in Ireland, H.E. Jean-Pierre Thébault. The French Ambassador welcomed media to the event and thanked them for their continued support of France, and in particular Paris, during 2015. There were some extremely worthy winners on the evening, all of which were voted for by Atout France representatives. According to Travel Media – organisers of the event in conjunction with Atout France – there were over 100 entries from all media and from all over Ireland. After the well-established annual France Meets the Media event, it was straight down to the business of the gala dinner and awards ceremony. The breadth and quality of entries was one of the features of the event and Tootlafrance.ie was fortunate to be nominated no fewer than three times in all (the highest of all participants) and Conor Power went up to receive the first prize on the list from the French Ambassador. The second prize followed soon after and it was superlative skiing specialist Catherine Murphy who was duly recompensed for yet another entertaining and informative piece from the slopes on Val Thorens. After a short break for another course of the gourmet dinner on the first floor of the Cliff Townhouse on St Stephen’s Green, the remaining three prizes were announced. The inimitable Jim Gallagher won the prize in the City Break category for his take on Toulouse in the Sunday World, while Best Destination Feature went to Kevin Gleeson’s intimate portrait of Carcassonne in the Irish Mail on Sunday. The final award of the night was a special one for Paris. Head of Atout France in the UK and Ireland Agnès Angrand made a moving and heartfelt speech about the importance of helping the French capital get back to its feet in the wake of the shocking attacks of November 13th last. Recalling some of her own personal anguish of the awful night in question, her speech was greeted with a strong burst of applause from the room before she announced the award was going to Irish Independent Travel Editor Pól Ó Conghaile for his article published in the immediate wake of the announcement of the Love Paris campaign. Below is a selection of photos from the night and a list of the winners and category nominees.